Level one is foundational – starting with narration and copywork. With the narration exercises .. the child is learning to take thoughts, put them into words and then place those words on paper using correct grammar & complete sentences. 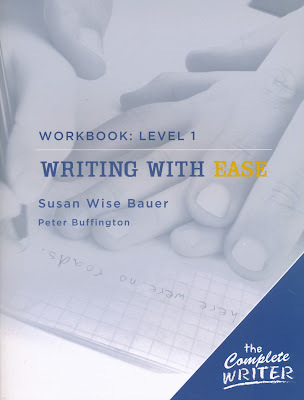 The copywork, some of which is set by S.Bauer and the other which is the students own work that they have narrated to you while you act as scribe, is introducing sequentially, or re-enforcing, necessary grammatical elements; punctuation, capitalisation, and complete sentences. Daisy initially found it a stretch some days to recall a detail in a complete sentence, but enjoyed the approach = retelling a key point she remembers dictated to me to write out then she copies it. The retelling is first assisted by preset questioning & encouragement to answer in complete sentences, then a small amount of copy work with light grammar lessons all taken from excerpts, in general, selected from great read alouds. Many of which are SL books. The lesson blocks cover a 4 day spread. We like to teach both styles of narration – ‘correct recollection’ (for research papers later) & ‘personal impressions retelling’ (free style/creative ‘story’ telling). Her creative ‘story telling’ is improving also as we use WWE 1. Needless to say … we like WWE 1. We do however get the children to diminsh their hand writing to fit up to the ----- line in the work book as the lines are too wide for their current handwriting skill. I use the same book for Bobbi but require much more from him, greater detail in the telling, he does his own writing of the thoughts he has just narrated. We'll probably jump him ahead to the next book, soon, as he seems to have mastered the skill required in this the first level. Both children really enjoy the excerpts given in the course, which have sparked an interest in our going on to read a title or two we may not have initially picked out to read, others are books we have read, or some we'll read in later Sonlight Cores.